The Africa RISING-NAFAKA project’s model for scaling and disseminating improved technologies has been lauded as “exemplary” and the kind of approach needed to ensure sustainability of improved agricultural interventions for farmers said Tanzania’s Minister of Agriculture Livestock and Fisheries, Hon Dr Charles Tizeba. The Minister made the remarks during his visit to the Africa RISING-NAFAKA Project demonstration site at Kigugu Irrigation scheme in Mvomero District on 28 June. He further lauded the model for being demand driven and ensuring the involvement of various stakeholders and encouraged other interventions working at the local level with extension officers and farmers to consider adopting the same approach. 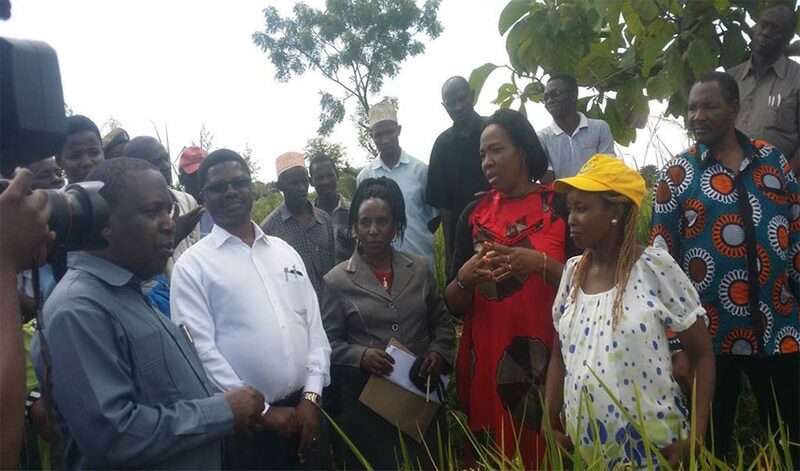 Hon Dr Charles Tizeba, Tanzania’s Minister for Agriculture Livestock and Fisheries (far left), when he visited the Africa RISING Project farmer demonstration site at Kigugu Irrigation Scheme in Mvomero District. “I urge all researchers and other stakeholders in agriculture to ensure that they provide extensive training to these extension officers for sustainability of agricultural interventions,” said Hon Tizeba after he was impressed by the depth of knowledge exhibited by the Village Agricultural Extension Officers (VAEOs) who responded to the technical questions he asked during the visit. The Africa RISING-NAFAKA project approach involves VAEOs as an integral part of the process in promoting improved rice production technologies among farmers. 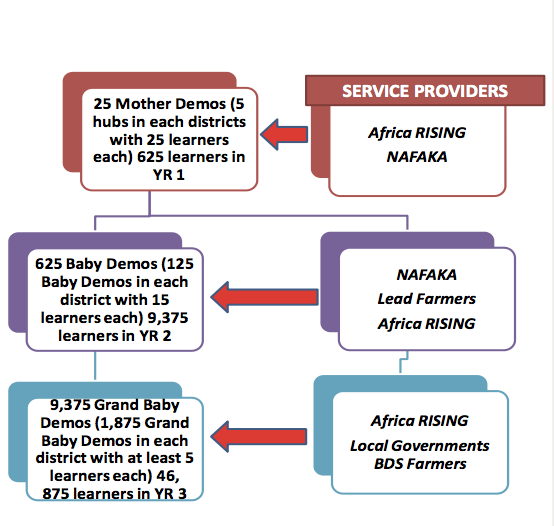 The scaling model involves the introduction of the technologies in the communities using mother-baby-grandbaby demo sites which serve as training/learning sites for extension staff and farmers. Extension staff and lead farmers undergo season-long training using the sites and they then train other farmers in a cascading mode, backstopped by staff from participating research and development institutions (see figure). Key principles that guide the process to make it successful include: international research institutions working with the national research institutions at all sites; close linkages and working with development partners, both government and non-government/private, that may be implementing activities in and around the project site; leveraging resources among participating institutions; close collaboration with District Agricultural Extension Officers, Ward Agricultural Extension Officers, and Village Agricultural Extension Officers; use of geographical information systems for better targeting of interventions; and ensuring regular communication via different modes (WhatsApp groups, reports, meetings) among stakeholders—farmers, implementing partners, government, and donors. Through the USAID-funded Africa RISING-NAFAKA Project, Dakawa Agricultural Research Institute (ARI- Dakawa) is leading implementation of activities to improve rice productivity in Tanzania’s Mvomero, Kilombero, Iringa Rural, and Mbarali districts. The project’s aims are three-fold: Ensuring that at least 47,000 smallholder farm households in rural Tanzania can access technologies to diversify and increase their food supply and income sources, and improve the quality of degrading smallholder cropland; expanding the area under improved crop production technologies by at least 58,000 hectares; and increasing the yields of both maize and rice by 50% as a result of the technologies being applied.